There is a narrative being spread on cable news and in left leaning newspapers that the Republicans are going to pay a very high price at the polls if Brett Kavanaugh is confirmed to The United States Supreme Court. It is a clear warning that women in the #MeToo era will rise up and destroy the GOP in the midterms for confirming a Judge accused of sexual assault. It will be a bloodbath they intone and it does not matter that so far there isn’t one shred of evidence to support the claims. The Republicans they tell us are doomed come November. It is a lie. No matter how many times it is repeated, it is still a lie. The funny thing is many of them know it and that’s why they are fighting so hard to stop Kavanaugh’s confirmation to the nations high court. Republicans are more united now than ever in the wake of what so many Americans view as an unsubstantiated political hit-job on Judge Kavanaugh; orchestrated by they believe by liberal Democrats and led by California’s octogenarian leftist Dianne Feinstein. This is a critical observation that flies in the face of the 24-hour a day liberal media onslaught against Kavanaugh. I am not alone in seeing what is actually happening across the country. New polling from Rasmussen shows support for Kavanaugh is growing following last weeks political brawl disguised as a confirmation hearing. I personally have spoken to dozens of women who are outraged that a man can see his whole life destroyed by allegations for which there is no evidence. They feel for his wife and relate to the story he told of his ten year old daughter asking to pray for his accuser, Christine Blasey Ford. 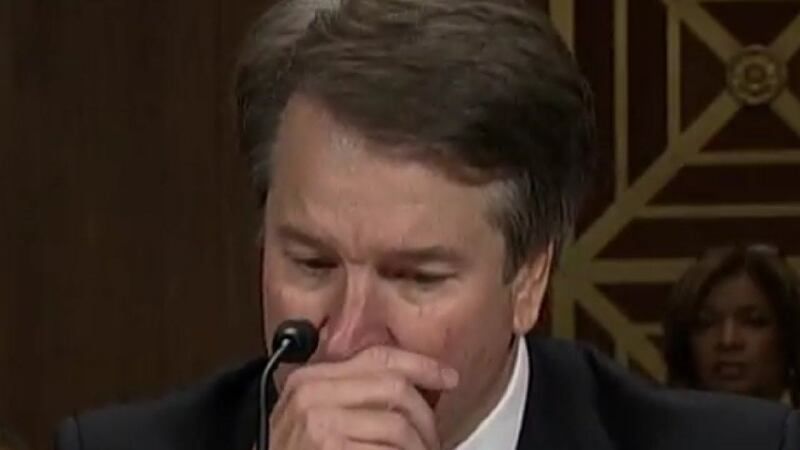 Judge Kavanaugh got choked up telling the story and so did millions of Americans. They were emotional tears that transcended politics and also secured support for him from millions of people. These tales of doom are nothing new of course and a play that we have seen many times before from Democrats. We were told prior to the 2016 election that women were ‘abandoning’ the Republican Party and Donald Trump would get crushed in the women’s vote. Both turned out to be false of course. In fact Trump won 52% of women voters in 2016. I think it is safe to say that Judge Kavanaugh is a much more sympathetic figure to women than is The President. We have also been told that if Republicans fail to get Kavanaugh confirmed they will also pay the price at the ballot box. Funny isn’t it, the mainstream media tells us if Kavanaugh is confirmed Republicans will get trashed in the midterms and if Kavanaugh doesn’t get confirmed Republicans will be crushed too. Seems the media is about as open minded about voters and their intentions as the Democrats were about Kavanaugh’s nomination in the first place. Remember at least 6 Democrats came out in less than an hour after it was announced to say they would fight against it. The takeaway is this: there are millions of women in America that are flat out appalled at how Judge Brett Kavanaugh has been savagely torn apart in broad daylight- a spectacle for all to see. It makes you wonder what men, especially white men who have been singled out as being particularly bad by the left will do when they get to the voting booth. The level of vitriol and viciousness is unparalleled in my lifetime in politics. If the left really believes this is a winning message they are sadly mistaken. The radical left is about to learn once again that the politics of personal destruction and identity politics in general are not embraced along main-street in this nation. This is still a center right country that believes in basic fairness and basic decency. Neither of which were put on display during the Senate Judiciary Committee hearing involving Christine Blasey Ford and Judge Kavanaugh. Many sympathize with the anguish in the voice of Ford but absent any supporting evidence most of us conclude there just isn’t enough there. We are left to assume that Judge Kavanaugh and his nearly three decades of public service without a single blemish on his record is probably exactly what he appears; a good and decent son, husband and father that has spent his life in pursuit of higher goals. I predict that the hard left that has worked so hard to weaponize the #MeToo movement will be shown in the midterms their aggressive message that men are for the most part evil, will fail miserably. There isn’t any other issue that has so galvanized the right in standing up to the leftist bullies in the room. Most will not scream and holler but they will turn out and they will vote. They will do so in record numbers and you can take that to the bank. The presumption of innocence isn’t reserved for one gender over the other. It is a foundation based principal in America and it isn’t reserved for a criminal trial as the left is also trying to hard to convince us. We are all entitled to the entirety of the Constitution. The left does not get to parcel out the protections we have all already been granted by our creator. The Republicans will not be punished at the polls if Kavanaugh fails to win confirmation but the exact opposite. Nobody likes a rigged game and nobody likes it when people cheat. To honest people it looks like Senator Feinstein and the Democrats were cheating and lying about it. The arrogant left that tried to ram its agenda down our throats by railroading a good man has once again energized silent populist outrage. That outrage will be heard once again on Election Day. Trust me.